If you own a dog with seemingly endless energy, you probably need to find ways to keep your furry friend active throughout the day. If you don’t, your pooch may “invent” his own fun “activities” out of your shoes, books, furniture, or anything else that can possibly be chewed on. While a quick run or time at the dog park may help alleviate some of your dog’s energy, rainy weather limits your options dramatically. In fact, many dogs shudder at getting their paws wet too, making it even harder to go out and take a walk or play fetch. Fortunately, there a few things you can do indoors that may keep your dog mentally and physically in shape (meaning out of trouble). The following games are a fun way to beat the raining day blues and exercise your dog indoors–both his mind and body! 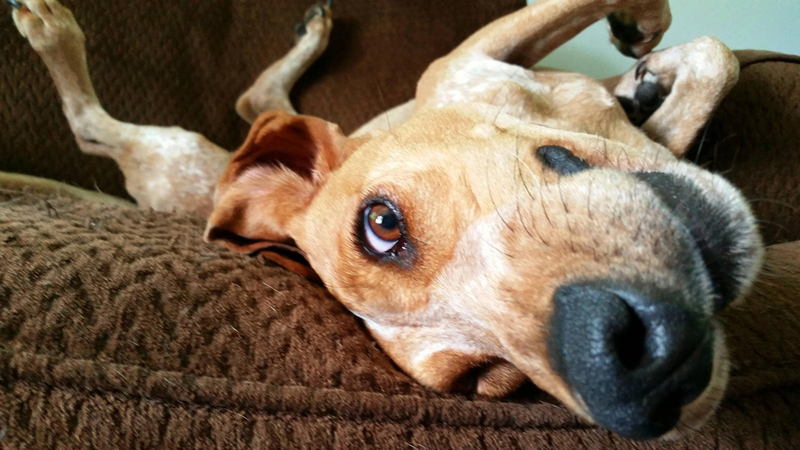 With all of the commands, running around, and strange positions necessary to get the perfect shot, taking some funny photos can be a great way for you and your dog to both get tired out. You may want to try staging your dog doing something human, like typing on a keyboard, or wearing a pair of glasses and looking at an old text books. 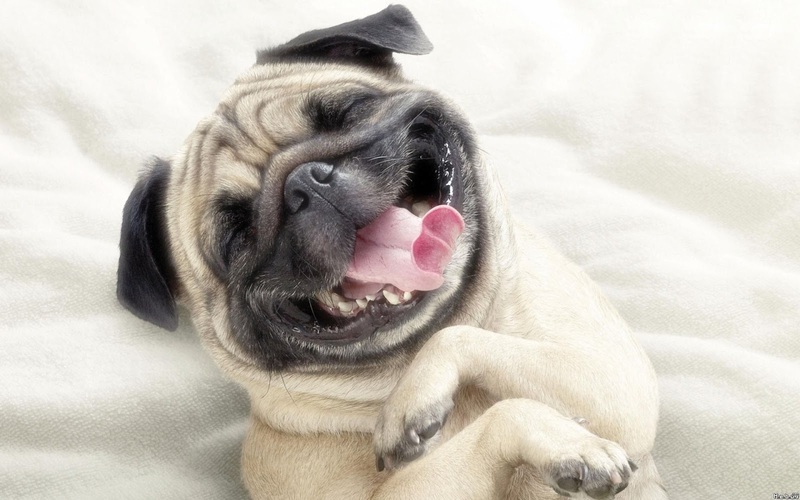 No matter what idea you choose, your dog will get plenty of attention, you’ll get some funny pictures, and both of you are sure to have a great time. 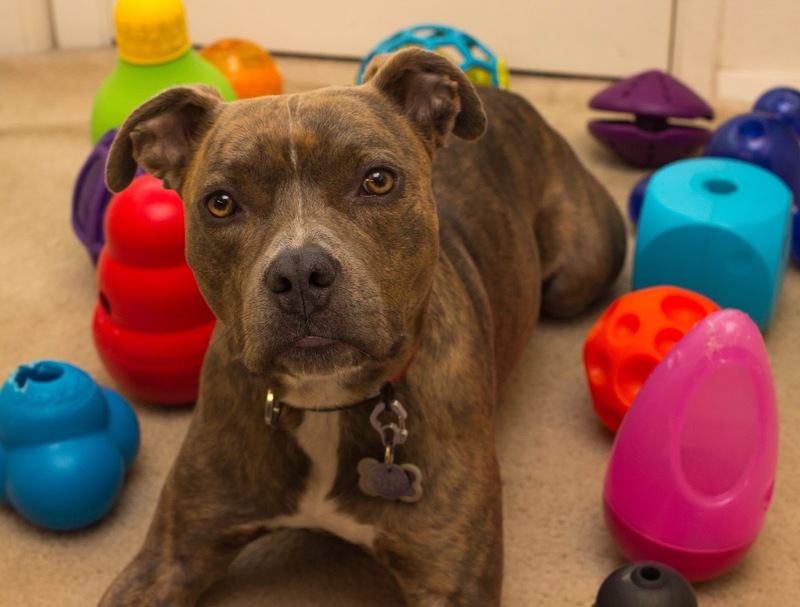 There are many types of food-dispensing toys that your dogs will adore (or at least they will love what’s inside which is the essential part!). Such products are great not only for rainy days, but whenever your dog is getting antsy or hyper (e.g. a pending thunderstorm) and you need a quick distraction. Simply throw some food inside, and let your dog roll, gnaw, and bob it all around the room until he gets tired or there is nothing left inside. With dog obesity a major issue, please remember to administer all treats and snacks responsibly. For suggestions to refresh your toy box, check our "15 Top Boredom Busters for Dogs". If you have kids, dog bowling can be a great activity to involve them in too. 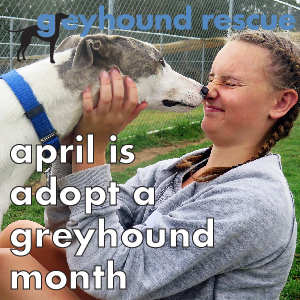 First, gather as many empty two-litre plastic bottles and milk jugs as you can — these will be the “pins.” Then, go into a long hallway or another area of your home where there’s enough room for your dog to run. Stand all the pins at the end of the room in a bowling-alley triangular formation. Finally, grab a tennis “bowling” ball and roll it toward the pins. If your dog likes to chase, he will probably go flying after the ball and knock over the pins. Set them back up and see who can get the most strikes. Or just brush up on some old ones... Dogs get more than physical exercise when they’re outside — they get mental exercise too. Working on training can be a great way to help keep them mentally active, even if they’re stuck inside. Whether you are teaching a puppy to sit, or just brushing up on some commands, if you push your dog’s abilities, they will probably get tired out pretty quickly. 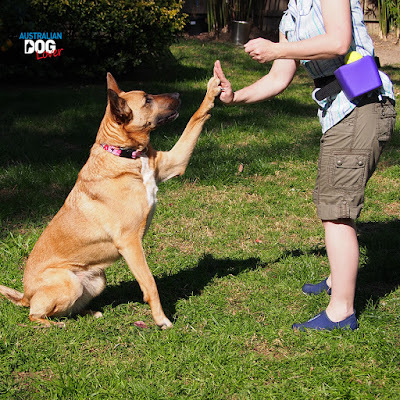 For suggestions, check "5 Easy and Fun Tricks to Teach Your Dog". Like dog agility, rally obedience can easily be done inside your house. Use cones or really anything lying around the house as markers for the course. If you have never done rally, it’s relatively easy! Each station gives you and your dog a command to follow. You can make up your own signs, or follow this link to print your own rally obedience signs. #6. Be Brave and Go Outside? 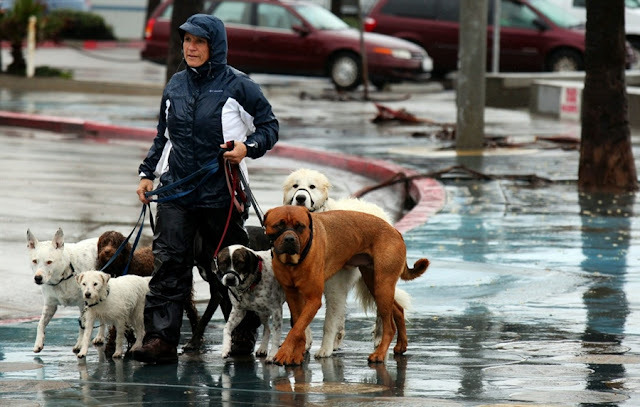 Dogs are waterproof, so don’t let a little rain scare you from taking them out. If they’re still full of energy after the first four suggested activities, maybe it’s time to throw on a raincoat and head outside. If you're looking for a trendy dog coat or raincoat, why not check the latest fashion trends in dog clothes? Don’t let a little rain stop you and your dog from getting active. 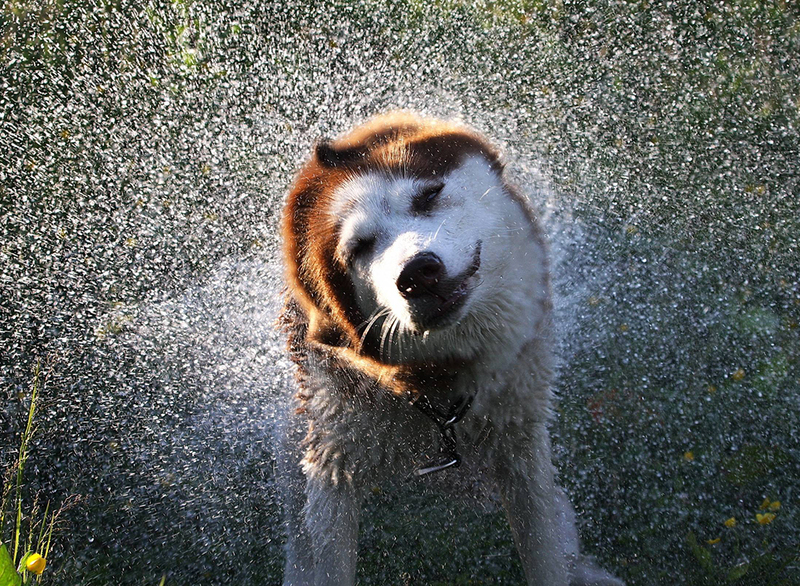 From canine bowling and puddle jumping to funny photos and food dispensing toys, there are plenty of things you can do to get your dog some mental and physical exercise, no matter what the weather. For more ideas on busting backyard boredom, you could also read our story on "Creating an Enriching Environment for your Dogs".